Spacieux condo rénové, à pied de gondole et du centre-ville, bains à remous, des équipements fantastiques! Le Ski Hill Condominiums est situé à 100 mètres de la télécabine Breck Connect et rejoignez la piste de ski Skiway Skyway. Il suffit de marcher dans la rue à la télécabine ou de sauter sur le bus jusqu'à pic 8 le matin et skier sur le Skyway Skiway dans l'après-midi. Juste un pâté de maisons de la rue principale du centre-ville, ce condo Breckenridge est votre clé pour des vacances reposantes. Ce condo à trois niveaux a été récemment entièrement rénové et fourni avec tous les tapis nouvelle, peinture, mobilier et la literie. Détendez-vous au coin du feu de bois en pierre après une journée sur la montagne, ou profiter d'un bain à remous extérieur des complexes. S'il vous plaît noter que la chambre à coucher est situé sur le 2ème niveau. Very nice and comfortable condo. 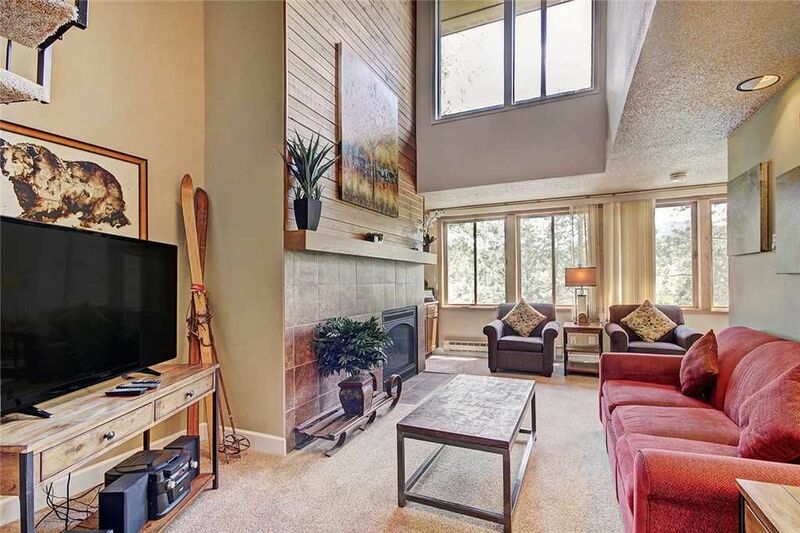 Condo is walking distance to town, free bus service and slopes. Beware the bedrooms are upstairs via a spiral staircase, very hard to get big, heavy luggage up them. Kitchen well stocked, only thing missing was dishtowels. Hot tub nice too. Wow, this place is fabulous. Nice and clean. Right by main Street and near the Gondola. Very convenient and I'm hard to please. I would surely recommend this one. The location of this property is perfect. We walked to the Gondola ever day, and over to main street. Parking is not fully covered so you may end up in a spot that has not been plowed and your car may get covered in snow. Finding the exact location is also tricky to find. The map is good but the complex isn’t well marked. Property was also super clean. What kept us from five stars were all the quirky things. Kitchen was well stocked (one of the best we’ve seen) but really only one person at a time could be in there cooking, and it was completely separated from the rest of the condo. Condo had plenty of space for the three of us, but the layout is weird. One full bathroom is downstairs where you don’t have a bedroom. Upstairs has the queen bed and landing with twin bed. That level had what our realtor calls a Hollywood bath (sorta jack and Jill). The upstairs twin beds are really uncomfortable and you have another spiral staircase to get there. Loft twin bed is really exposed to everything downstairs. Queen bed was comfy but sheets were pretty rough. All in all, we would stay there again but it wouldn’t be the first pick. Great in all regards. Minor comments: could use a night light in the master bathroom. Could use extra blankets in the bedroom. Could use a light switch upstairs to control the lights for the stairway. The condo was perfect for our family of 5 (2 adults, 3 kids, aged 6, 5 and 3). The proximity to Main Street and the gondola was PERFECT for us. The only time we had to drive was to the grocery store, and I could have walked there too, but I just didn't want to carry the groceries back. The kids used the pool and hot tub, but the Breck air temps were too cold for my wife or I to get in... There was only 1 real concern that we had, and since we were there in Summer and there is no AC. Having the windows open made it easy to manage t he temps, but there was quite a bit of traffic noise coming from the street below (particularly trucks since they can't go down Main St.). The top loft where the kids slept was 5-10 degrees warmer than the lowest level, but that is where the kids slept and they're kids, so they didn't care at all. We would definitely stay there again.